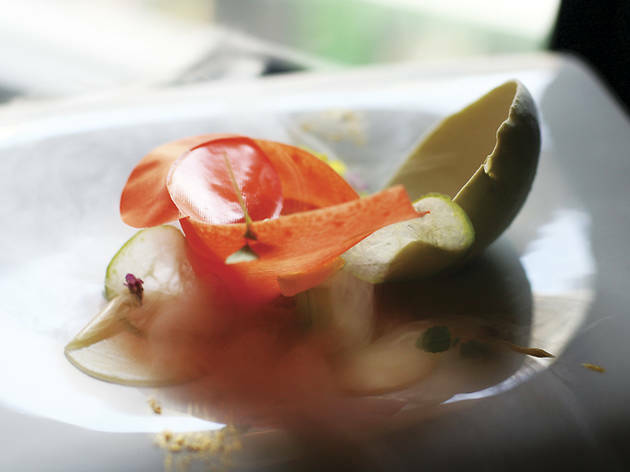 The Luxe Manor has been in a bit of a flux since chef Roland Schuller left their Italian restaurant Aspasia two years ago to head The Drawing Room in Causeway Bay. While the opening of FINDS (which replaced Aspasia at the end of 2010) was a definite boost, the hotel has been lacking a signature restaurant and chef to breathe new life into their dining scene. Enter their new high-end venture G.e – that is, gastronomy extra | ordinaire – and chef Gianlugi Bonelli. If you’re not familiar with Bonelli, it’s probably because you never held membership at KEE Club, where he was head chef for close to a decade. Bonelli has mapped a culinary career all around the globe with posts at small eateries as well as the Michelin-starred kitchens of Le Calandre, El Bulli and Fat Duck. Arriving in Hong Kong in 2002, Bonelli was also among the first generation of chefs to bring modernist, molecular cooking to our shores. Now, it’s a little late to call Bonelli avant-garde. After all, turning soups into solids and powderizing ingredients is hardly a new-fangled thing anymore. But Bonelli is definitely still a true artiste – and a pretty crazy one at that. His eight-course tasting menu at G.e is a phantasmagoria of flavours and textures, starting with a selection of amuse bouche that includes a cube of tuna specked with puffed rice served on a wiry metal contraption seemingly designed to take out your eye. Then there’s the thumbnail-sized quail egg topped with caviar and presented on a silver spoon with a pipette full of vinegar sauce (squirt and swallow... draw your own inference). Moving officially down the menu, courses read two lines long in a vaguely dadaesque jumble of ingredient names and adjectives. The first dish rolls out as – deep breath – the “MONOCHROMO IN GOLD: SCAMPI-pressured-cucumber-sea urchin-corn-avocado²-edible-flowers-all’oro-virgin-olive oil-carrot-sorbet” (I’m not making this up). It’s so overwhelming that it’s difficult to recall any one particular taste. Crisp, paper-thin slices of cucumber fawn over slivers of creamy uni in a delicious combination; small pellets of crushed corn carry such an intense nutty, smoky flavour, it invokes thoughts of a summer barbecue. Everything else on the plate is lost in the dizzying clutter of ingredients. The next course tastes less haphazard than the first and reigns in on simple, earthy flavours. A small sphere of potato is arranged centre plate over a thick pool of béchamel sauce. It’s a comfortingly familiar pairing, further enhanced by the aromas of sage leaves, tonka and a savoury sprinkling of sandy black olive “soil”. Unfortunately, the potato arrives a touch undercooked and is difficult to fork through without applying some wrist pressure. The most memorable savoury course is probably the fourth – a beautiful egg-themed dish orchestrated from a dashi gelee, Parma ham, finely chopped chives, another bunch of indistinguishable ingredients (tofu and yuba, according to the menu), creamy Jerusalem artichoke ravioli and a thoroughly intriguing film of egg yolk jelly plastered to the side of the bowl. Next, filet of dover sole blanketed in a thin, translucent sheet of butterflied shrimp. A “garden” of watercress, zucchini and tomato prepped three ways surrounds the fish, with a generous heap of oscietra caviar on the side. Not bad, but not entirely memorable either. For the most part, Bonelli’s dishes succeed in delivering that visual wow factor; but parts of the menu come off feeling more like a canvas for Bonelli to show off his skills rather than food designed to feed the guests. The third course, composed of a thick slab of foie gras paired with fragrant coconut flakes, pink tapioca (two versions – soft and pudding-like, and puffed into cracker form), mushrooms and pickled beets, is stunning but the clash of heavy ingredients weighs down the palate. Same with the Bresse pigeon breast. The rare-centred red meat feels all the more stodgy plated with thick polenta, quinoa (delicious as this was) and a crispy wafer cone filled with yet more foie gras. Bonelli does excel in his sweets. (Should he have been a pastry chef?) The palate cleansing “Tomo della valsesia” is a yogurt-like foam (a mix of cow and ewe’s milk) imbibed with pop rocks that crackle away happily on the tongue. And then there’s real dessert – a messy but fully delicious serving of warm, melting chocolate “biscotto” perfumed with light Madagascar vanilla cream, green cardamom and an intense, concentrated touch of citrus owing to flash frozen “nitro” blood orange. 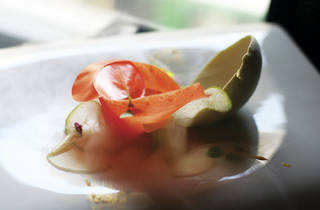 2/F, The Luxe Manor, 39 Kimberley Rd, Tsim Sha Tsui, 3763 8803; www.gedining.com. Tue-Sun 7pm-11pm.